The Dexter breed originated in southwestern Ireland from which it was brought to England in 1882. The breed virtually disappeared in Ireland, but was still maintained as a pure breed in a number of small herds in England. The Dexter is probably the smallest breed that was developed in the British Isles, with mature cows weighing between 600-700 pounds and mature bulls weighing about 1000 pounds. Considering their small size, the body is wide and deep with a well-rounded hindquarter. 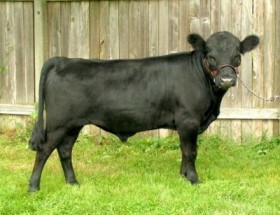 Although usually black, a dark-red or dun Dexter is sometimes found, all animals are always solid, with only very minor white marking on the udder or behind the navel. Horns are rather small and thick and grow outward with a forward curve on the male and upward on the cow. 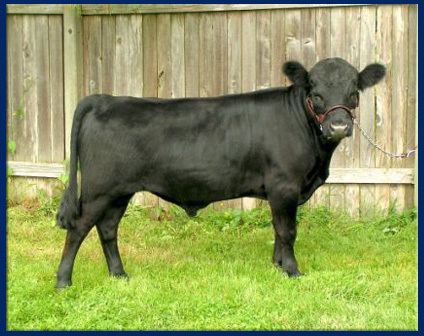 The breed is typically a dual-purpose type, although individual herd owners often concentrated on growing either a beef or a milk animal. Considering their size, the cows are unusually productive. Individuals on reasonable feed may give 5,000-6,000 pounds of milk a lactation with 4.5 percent fat content. Some have yielded as much as 12,000 pounds – a remarkable accomplishment for a 600 pound cow. The occurrence of lethal “bulldog” calves was unusually high. The breed society in England meticulously required the recording of any bulldog calves so the parents could be culled. One interesting theory that has been advanced for this factor in the Dexter is involved in the early exportations to England. When they were first introduced in Britain, because of their small size and productivity for both milk and beef, they became very popular and were sought after as show animals. The small Dexter and the larger Kerry cattle of Ireland derived from the same base stock, and when the demand could not be supplied by pure Dexter’s, dwarfish-type Kerries were sorted out and shipped to England as Dexter’s. This concentration of abnormally small Kerrys in the English herds is advanced as the reason for the excessive appearance of bulldogs in the English strain.